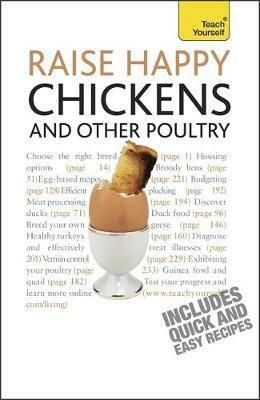 Is this the right book for me?Raise Happy Chickens and Other Poultry is a quickly accessible but authoritative guide, suitable for total beginners, that provides all the information you need to start keeping your own chickens.Telling you which breed of bird lays best and providing useful guidance on housing, equipment and the necessities of day-to-day care, it meets all the needs of anyone who dreams of a garden full of happy, clucking birds. It also goes beyond just chickens to other types of poultry, and gives advice and practical guidelines on housing, with full explanation of key areas like welfare, behaviour and diet.Raise Happy Chickens and Other Poultry includes:Chapter 1: ChickensWhich breed is best for you?BuyingHandling chickensStart-up costs and other considerationsHousingRoutinesFeeding and wateringHealth, welfare and behaviourHow to cope with a broody henSelling eggs: the regulationsWhat to do when you want to go on holidayBreeding your own stockChapter 2: DucksWhich breed is best for you?BuyingHandling ducksStart-up costs and other considerationsHousingRoutinesFeeding and wateringHealth, welfare and behaviourHow to cope with a broody duckSelling eggs: the regulationsWhat to do when you want to go on holidayBreeding your own stockChapter 3: GeeseWhich breed is best for you? BuyingHandling geeseStart-up costs and other considerationsHousingRoutinesFeeding and wateringHealth, welfare and behaviourHow to cope with a broody gooseSelling eggs: the regulationsWhat to do when you want to go on holidayBreeding your own stockChapter 4: TurkeyWhich breed is best for you?BuyingHandling turkeyStart-up costs and other considerationsHousingRoutinesFeeding and wateringHealth, welfare and behaviourHow to cope with a broody turkeySelling eggs: the regulationsWhat to do when you want to go on holidayBreeding your own stockChapter 5: other breeds - guinea fowl and quailGuinea fowlQuailChapter 6: Meat productionGeneral principlesSlaughterPlucking and hangingProcessing and cleaningTrussingChapter 7: Diseases, problems and general troubleshootingFree-range poultry diseasesCommon problems and some causesCommon diseases by ageLife expectancyDescription of major diseasesChapter 8: Cooking with eggsFavourite recipes Learn effortlessly with an easy-to-read page design and new added features:Not got much time?One, five and ten-minute introductions to key principles to get you started.Author insightsLots of instant help with common problems and quick tips for success, based on the author's many years of experience. Test yourselfTests in the book and online to keep track of your progress.Extend your knowledgeExtra online articles to give you a richer understanding of chicken keeping.Five things to rememberQuick refreshers to help you remember the key facts.Try thisInnovative exercises illustrate what you've learnt and how to use it.